The NBC Boston Investigators filed public records requests with the Bristol County Sheriff's Office earlier this month after Hernandez committed suicide seeking the former New England Patriots star's disciplinary records. The 104 pages of records released Thursday afternoon include new details about Hernandez's long history of discipline during his stay at the Bristol County Jail, including how he yelled at a guard about how he'd "show him how to be a man," how he threatened to kill a guard, and how he threatened a guard who had written him up by saying he had a dream where he was chasing the guard and his family while they were on vacation. He was repeatedly disciplined during his time in jail. In one appeal, he wrote 17 one-line hashtags, including #thisjailiscorrupt and #tellthesheriffisendmylove. According to the records, at one point, rather than getting caught with a note, Hernandez ripped it up and ate it in front of a guard. 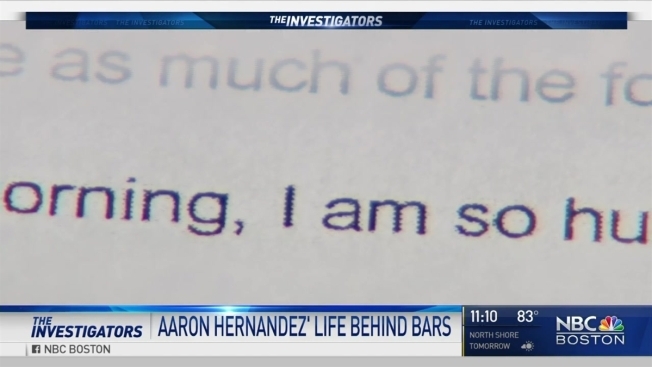 The documents also detail how Hernandez would pass notes to other inmates using fishing line, and how he would write to his attorney using rap lyrics so the guards wouldn't be able to tell what he was saying. They also describe a dispute between Hernandez and another inmate where the inmate referred to Hernandez as a member of the Bloods gang and then spit in his face. Hernandez, 27, hanged himself in his prison cell on April 19 while serving a life sentence for the 2013 killing of Lloyd. His suicide came five days after he was acquitted in a separate double slaying in 2012.